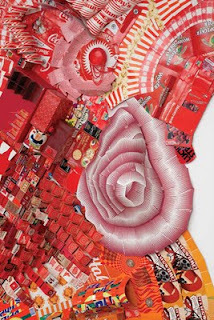 If only all of our recycling ended up in the studio of New York based artist Lisa Hoke. 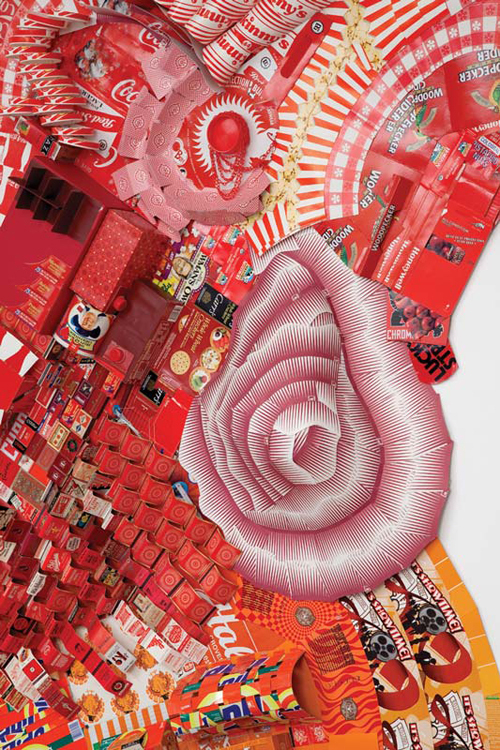 She would most certainly create grand and colorful "assemblages," for you to enjoy. Until that day arrives, a visit to The Elizabeth Harris Gallery would be the best way to see the beautiful and eye-popping pieces she creates from what we would normally discard. Ask your children to point out cereal box covers, matchbooks, cups, wrappers and containers of all kinds. The intoxicating colors remind us why we grabbed them with gusto from the grocery shelves. The endless amounts of it, is a testament to how much we consume and then toss away, "American style." No doubt the discussion will lead to questions like how did she accumulate all of this? You can confidently say: " a support network of faithful recyclers and her building's superintendent." Ms. Hoke's work is also currently on exhibit at MASS MoCa at Kidspace. The exhibition entitled "Basic Utensils," is up until September 5, 2011.